Good morning from Milano! I hope you are all doing well! Today I am back with another post from lovely Italy, this time shot at another famous locations in Milan - in front of the Duomo cathedral, the symbol of the city. I am not gonna lie to you - I had to get up damn early in order to take the shots, but I think they're worth it. When I am in a different city, I am always looking for a piece to buy. It's kind of a tradition I do. Not only I am rewarding myself for my work and motivating myself, but then the piece also reminds me of the place where I got it from. With my birthday coming up, I decided to spoil myself a little bit with a very, very special Louis Vuitton piece. If you follow me on Instagram, then you might know that I was actually deciding between LV and a Chanel bag with a top handle. I decided to go for the Louis Vuitton for 3 reason: 1) it's something new and a little unexpected in my collection and that's why I think it's worth it, 2) it's such a special and unique piece and 3) I already got a top handled Chanel bag in February, which looks wayyyy better than the one I was looking at. Today I went for an all-black combination, wearing a white blouse together with a cute black skirt. I have added my Dior slingbacks with stones and my J'Adior bag. So, how do you like the shots? Krásný podvečer ze slunečného Milána! Dneska mám pro Vás další focený na dalším ikonickém milánském místě. Myslím, že vetšina znás pozná Piazzu del Duomo, na které jsme dnešní fotky fotily. Nebudu lhát - vstávaly jsme ještě za tmy, aby jste se vyhly neskutečné mase lidí, která po náměstí o pár hodin později proudí.. ale myslím, že výsledek stojí za to! Dneska jsem na sebe zvolila bílo-černou kombinaci halenky a sukně, kterou jsem doplnila novými slingbacks z kolekce J'Adior a kabelkou ze stejné řady. Jak můžete vědět, ani ne za měsíc budu mít narozeniny, a tak jsem se rozhodla si koupit něco "from me to me". Rozhodovala jsem se mezi Chanel kabelkou a Petite Malle od Louise Vuittona, která nakonec vyhrála. Myslím, že se jedná zase o něco jiného a nečekaného - navíc hnědou kabelku ve svém bohatém šatníku postrádám. Tak jak se Vám fotky líbí? Okay, first of all, the Storets top is beautiful! I adore the belle sleeves and the black trimming. 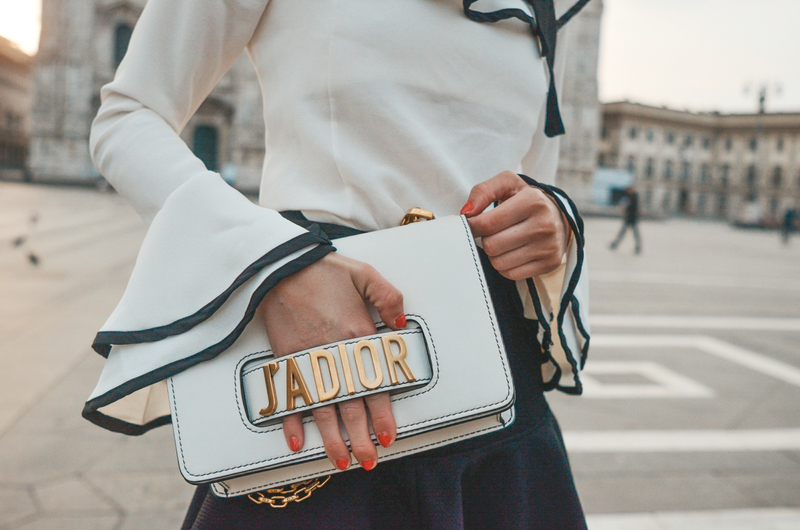 Super stylish with your Zara skirt, and of course, the Dior heels :D The J'adore bag couldn't have been a more perfect match! Secondly, you are so lucky to be in this incredible sport in Italy! I've pretty much been planning my next trip around your blog posts. I would love to see a post on your favorite spots in Milan, including restaurants, hotels, and streets to shop! Now, thats a super perfect white bag! Gotta love Dior! Wow, this looks absolutely amazing! <3 I love the outfit as much as the location. You can't look cooler dear! And your bag is a dream! is it really true that you don't use presets for editing your pics? You only use apps like VSCO, Snapseed etc. ?